How about a game of chess? Although the traditional chessboard wears many faces, Reddit user benjaab123’s simple yet classic 3D chessboard is definitely a standout. The Redditeer built the outer rows higher than the inner rows, giving the 3D chessboard an interesting depth. He also decorated the pieces with shapes that correlate with their moves and slanted the board to give it a 3D effect. Tournament chessboards have some very specific sizing guidelines. The recommended square size for larger boards is 57,15 by 57,15 millimetres. Now, unless you’re planning to use the 3D chessboard for anything but aesthetics and playing at home, we recommend making the squares and pieces as big or small as you prefer. The board. benjaab123 chose to use basswood (also known as tillia and linden) for the lighter squares and cedar for the darker squares. These woods might be difficult to come by locally, so we suggest you head to your local DIY store to see what’s in stock. If you’re convinced that basswood and cedar is the way to go, we recommend contacting an exotic wood supplier to find out if they have smaller pieces available. You’ll also need one large, solid piece of wood to serve as the base of the board. benjaab123 used a strong, bonded wood in a light colour as the base and stained it darker than the cedar to finish the board off. The chess pieces: if you’re planning on fashioning your own chess pieces, you’ll need extra wood in the corresponding colours. His tools for the project include a circular saw, spray gun and a drilling machine. He also used sandpaper, wood glue, fast-acting adhesive (superglue), water-based polyurethane (clear coat), contact adhesive for the base, some wax and 32 fishing weights for the chess pieces. Cut the squares. benjaab123 says ensuring the uniform square size of the squares took him much longer than expected. The squares will come in four heights, of which each height will have 16 squares. The tallest squares will be placed on the outer left and right edges of the board and will become shorter until the centre two rows are the same height. benjaab123 made the squares for the position of the king and queen pieces slightly taller than the other squares, but this is up to you. Take a look at image 4 below to see the slightly taller squares. Remember to sand your squares. Prep the base. Ensure that the size of your base board is equal to the size of your 64 placed squares. Once your board is cut and ready the square placement can begin. Place the squares. benjaab123 used wood glue and fast-acting adhesive to stick the squares to the base. Pay attention to your alignment and the position of the squares. To avoid confusion we recommend packing the squares in order before you start with the adhesive process. Cut your chess pieces. With the board completed you can cut your chess pieces to size and fashion them as desired. Add weight to your chess pieces. benjaab123 cleverly figured out how to give some weight to the pieces by adding a small fishing weight to the bottom of each piece. To do this, simply drill a hole slightly broader than the fishing weight into each piece. Once the weight is inserted, use the wax to seal the hole. benjaab123 adds that he went back and added DC-Fix (a self-adhesive vinyl) to the bottom of each piece. See what he used in image 12 below. Seal the wood. benjaab123 used a fairly new product to seal the wood. It is a water-based polyurethane known in some countries as clear coat We couldn’t establish if this product is available in SA, but if you’re unsure what to use just ask a paint expert at your local DIY store. If you want to ensure that the base of the 3D chessboard doesn’t scratch the surface of your table, consider adding felt or self-adhesive rubber feet to the bottom, like the kind used to stop the feet of furniture marking floors. And that’s that! 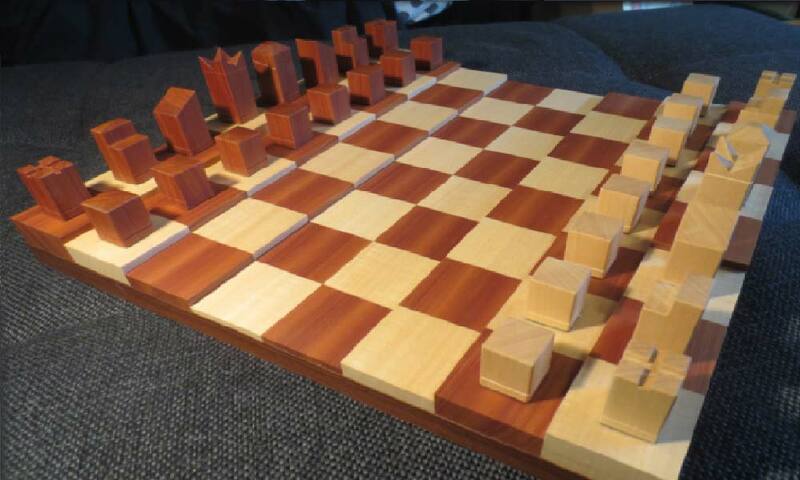 Take a look at the original 3D chessboard project below. Also be sure to let us know if you decide to do the project yourself. Below are photographs from the original project. How Samsung Won Over a Hater with the Galaxy S7? How to Change Themes on Samsung Galaxy Devices?